Most of us have only one story to tell . . . only one that matters, only one finally worth telling. This is mine. 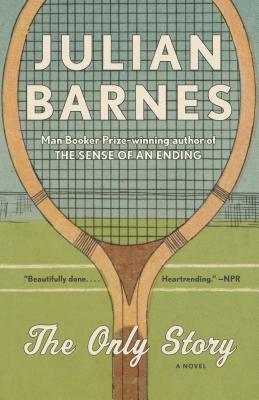 One summer in the sixties, in a staid suburb south of London, nineteen-year-old Paul comes home from university and is urged by his mother to join the tennis club. There he’s partnered with Susan Macleod, a fine player who’s forty-eight, confident, witty, and married, with two nearly adult daughters. She is a warm companion, her bond with Paul immediate. And soon, inevitably, they are lovers. Basking in the glow of one another, they set up house together in London. Decades later, Paul looks back at how they fell in love and how—gradually, relentlessly—everything fell apart. As he turns over his only story in his mind, examining it from different vantage points, he finds himself confronted with the contradictions and slips of his own memory—and the ways in which our narratives and our lives shape one another. Poignant, vivid and profound, The Only Story is a searing novel of memory, devotion, and how first love fixes a life forever. Julian Barnes is the author of twenty-two previous books, most recently The Noise of Time. He received the Man Booker Prize for The Sense of an Ending, and has also received the Somerset Maugham Award, the Geoffrey Faber Memorial Prize, the David Cohen Prize for Literature, and the E. M. Forster Award from the American Academy of Arts and Letters; the French Prix Medicis and Prix Femina; the Austrian State Prize for European Literature; and in 2017 he was awarded the Légion d’Honneur by the French government. His work has been translated into more than forty languages. He lives in London.